Video games. Usually dark, violent and laced with incredible music. 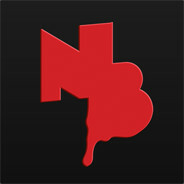 New Blood at PAX East! WE MAKE 'EM SO THEY GOTTA BE GOOD, RIGHT?! A retro FPS for the ages! Once branded a HERETIC. Now YOU have been chosen as our champion! Reclaim our sacred weapons. Take back our ancient lands. If you can stand... AMID EVIL. The original soundtrack for Super Galaxy Squadron by Random Encounter!